Digital Subscriptions > Learn Hot English > 179 > NAUGHTY EMPLOYEES! You’re going to read an article about some things employees did. Look at the paragraph titles. What do you think happened? Make notes. Read or listen to the article once. Were any of your ideas from the Pre-reading activity similar to the ones in the article? Which employee behaved the worst, do you think? Why? Read the article again. Then, answer the questions. 1. What was the intern locked inside of? 2. Who did the intern call? 3. Who was the server in the restaurant arguing with? 4. What did the server say the drink was? 5. What illegal object did the employee bring to work? The latest issue of Hot English (179 – the April issue) is out now! Learn over 300 useful words and expressions and improve your listening skills with Learn Hot English! 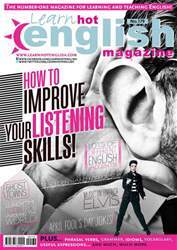 This month: How to improve your listening skills! Learn how to listen more effectively. This will help you at work and with your personal relations, as well as improving your ability to listen in English. Plus, 12 useful words to describe lunchtime food, 10 useful past tense verbs, 8 words to use at the amusement park, 10 important words for describing the “economy”, “embarrassing” idioms... plus: • Quiz – what’s your workplace personality? • Food – lunchtime! • Mystery – ghost towns • Health – the benefits of yoga • Language – how to paraphrase • Politics – things that got banned • Workplace humour – naughty employees • Medicine – are you eating too much salt? • Cinema – Young Frankenstein • Cuisine – Eggs Benedict • Humour – April Fool’s Day jokes • Crime – stupid criminals • Music – ABBA and Elvis Presley • Nature – cute animals that bite • History – conscientious objectors • Terror – The Golden Hand AND LOTS, LOTS MORE! By reading and listening to all this great content, you'll improve your English reading and listening skills and learn up to 300 useful words or expressions. Plus, you'll get a better job and pass English-language exams more easily. Guaranteed! HOW TO IMPROVE YOUR LISTENING SKILLS! WHAT DO YOU LIKE ABOUT FLYING? TWO MEN WHO WOULDN’T FIGHT!